I have chosen for you here a classic dish – Chicken with Chianti [Pollo al Chianti] as together the full flavour of the wine and red pesto give this dish a rich colour and almost spicy flavour, while the grapes add a delicious sweetness. Serve with polenta or simply hot ciabatta from the oven. A salad of rocket and watercress will complement this dish, no need for vegetables or potatoes, simple and rustic Italian style. 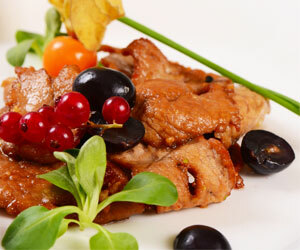 Italian Chianti of your choice is the perfect accompaniment to this fantastic dish. Note: If you wish to try this dish with white wine, then substitute with green grapes and green pesto. You can always add some mascarpone cheese at the end to enrich the sauce. As for the wine, try it with Tesco *finest Soave Classico Superiore.